Sister has always been very timid. If there is a sudden loud noise or a knock on the door, even a rattle of a plastic bag, she runs to my bedroom and hides. She runs away if she sees me following her down the hall, as if I were chasing her. Sister is so polite that if she wants to sit in my lap she jumps to the arm of my recliner and waits for me to put a folded blanket on my lap to protect my legs from her kneading. She hesitates before walking across my lap from one chair arm to the other. Sister is always the one who wants to just stretch out lengthwise on my lap, with head at my knees and her body draped leisurely on my thighs to take a nap. Every now and then Sister will lift her head, turn it towards me and lift her chin. I know then she is requesting (or is it demanding?) a chin rub. If I am typing away on my computer keyboard at my desk, Sister is the one who runs and jumps up on the table first. She wants to walk back and forth between my computer screen and my eyes. After a little petting I have to block her from walking back and forth. I even cleared a large spot for her to sit on the table beside me with great access to a window’s sunshine. Does she want to sit there? 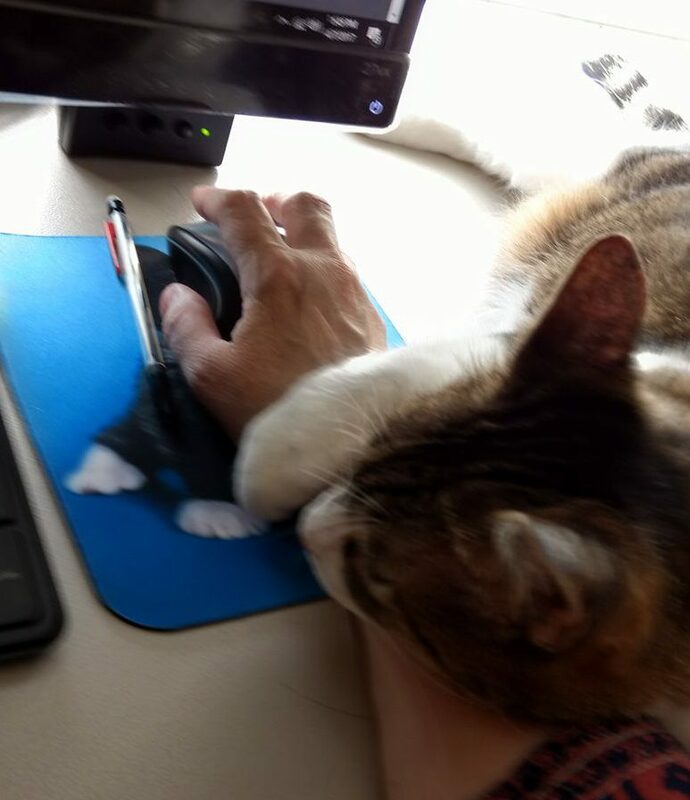 No, she wants to rest her head on my hand, while it is on the mouse. (This somewhat hinders the smooth transition of ideas to fingers and to keyboard.) So after a few strokes of her fur, I make her stay in the sunny spot on the table. Does she recognize that I was being thoughtful? No, she gets huffy and jumps off the table with hurt feelings. Then I feel a little guilty. There were signs that someone thought she was the queen at least some of the time. 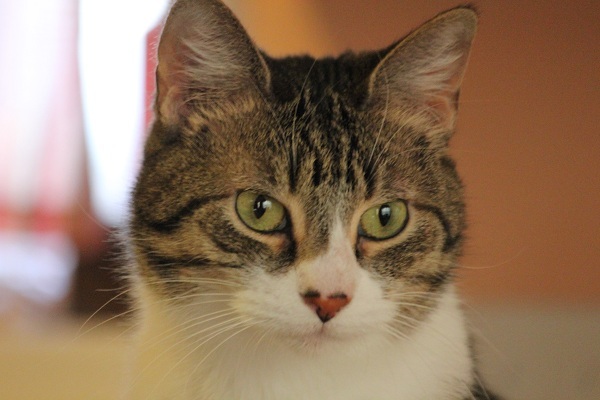 When I walk down the hall past the guest bathroom, Sister can be found standing expectantly by the bathroom sink, looking at me out the door and uttering a sharp, commanding, “MRROW!” I know from where she is that she is asking, uhh, commanding that I give her her brushing and NOW!! She doesn’t just want me to brush her. She wants me to hold the brush by one cheek as she rubs against it two or three times then offers the other cheek so she can leave her oils, scent or whatever on the brush to be disseminated along the paths of the brush into her fur! Somehow Sister knows about my frequent guilt trips when I am afraid I have slighted one or the other cat. She plays on my guilt after she studied my behavior when I accidentally almost(?) step on Norie’s tail. (I never know for sure if I did or not, since the reaction is the same either way.) She sees how sorry I am when I hurt one or disappoint them. Well, she knows how to let me know what she wants. 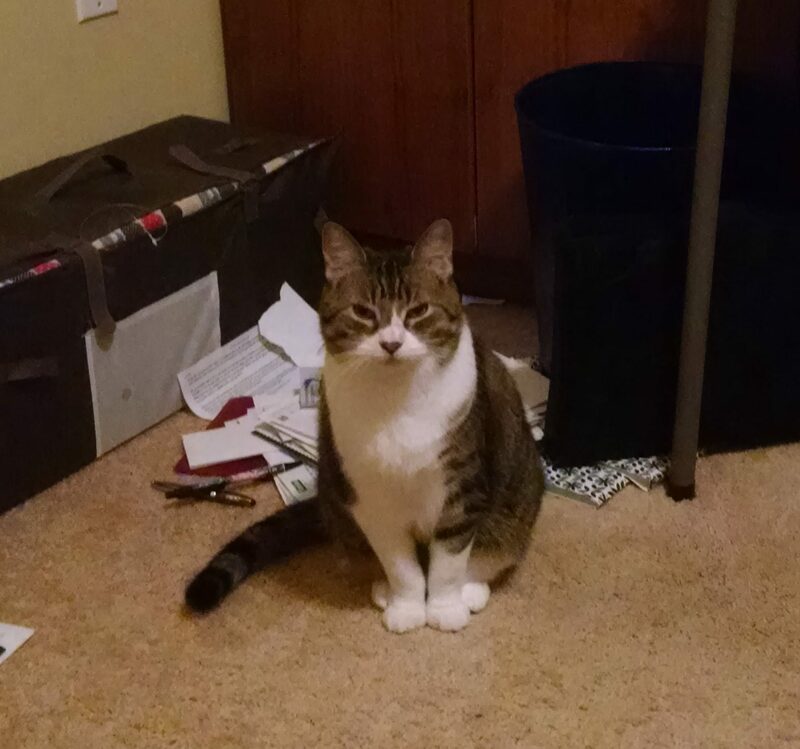 She will stare at me quietly with a certain “look” while sitting in the bedroom doorway for an unknown amount of time (at least several minutes). If I purposefully ignore her after a few minutes, she comes closer and stares at me some more. If I put the blanket on my knees she walks away. “Do you want food?” I ask. Then she races off to the kitchen. Aha! I realize that she wants FOOD! Recently I have experienced a new problem. Sister loves to hide under my comfort number bed. She loves the solitude and quietness I guess. But when it is time for her medicines she runs to hide there every time she sees me getting the medicine ready. I did find that a Styrofoam pool noodle is helpful in nudging her out from under my bed, if I leave one side open for her. There is another problem. Sometimes in the middle of the night she hacks up a hair ball. The bed is a full size bed. It would be quite difficult for me to clean it up if she left a wet, hairy mess under my bed! Protecting the under world of my bed. Then Sister found out she could squeeze between the bed and the bedside cabinets! So I filled that space in. Next when I raised the foot and the head of the bed, she discovered that the foot of the bed retracts and leaves her a lovely opening to get under the bed! Now I just have to be sure she is on the bed beside me before I raise the head or foot of my bed! I think I have the underworld of my bed sealed off now; at least until Sister finds another way under my bed. So who’s the boss in my home?? Is my situation out of hand? Cats! Too clever but gotta love ’em! My future is in their paws. Yes, I fear they are somewhat pampered. Thank you! She is smarter than I knew! Hugs and wishes for your continued good health.